We like our slides big, bright, and beautiful! 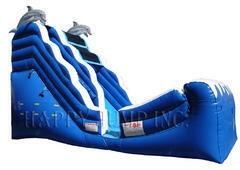 MPCpartyrental.com has a great selection of awesome inflatables slides sure to be the centerpiece attraction at your next party or event. Be sure to check the sizes of these unit and confirm you'll have enough space at your location. Browse the selections below and click on the "More Info" link to get more information and to make a reservation.